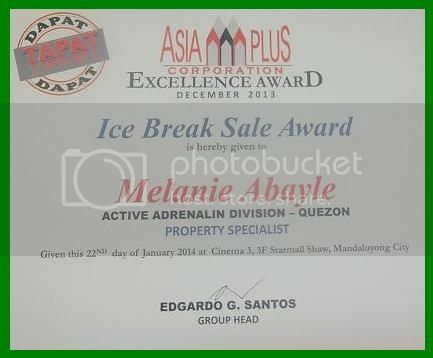 I want to say thank you to all Asia Plus Camella all over the Philippines for giving this ice brake sale award. In my two months in your company this is the second time that I received and award my first award is the ice breaker award same here the ice brake sale award. As our property specialist I need to give my full support to my work to have more awards 🙂 . Hopefully the blessing of our God will be continued. Thank you God for everything you’ve done to me. Last week my hubby referred our faucet because it’s already broken. I am very thankful to my hubby because he knows everything on how to refer not only the faucet but any kind of a thing. He knows everything on how to refer our car machine, the electricity and our computer shop business sometimes he is a carpenter. Sometimes I feel irritated to him because all of the things in our house he make intervention but I realized that he’s right because he know everything in our house. No need to get the plumber, electrician, carpenter to pay them because my hubby is here. Anyhow, those are the hobby of my hubby during he stayed here in our house that I already shared 🙂 . Because of the hobby of my hubby he needs a lot of tools to use. And I think I need to suggest the imprinted promotional products to buy some tools he needed. Not only tools because this kind of online store is very wide and you can choose everything what you want. They have a lot of products you can find it. Aside from that you can really enjoy shopping because the price is already affordable. Our second hand car is almost 3 years today. This is the time that I need to learn how to drive, to get driver license and need to become brave during driving. Today I really enjoy driving and I don’t feel nervous because last time I really feel that but it also normal for the new beginner like me according to my instructor. Anyhow, my hubby is very aware to drive and every time he encounter the strange he also check up the parts of the machine. He also used the different kind of tools like, screw driver, Philips, socket and valves for a pump. Aside from that to check the car machine like engine, fluids, water and other parts before we travel is very important to make it sure that it is in good condition and running smooth. 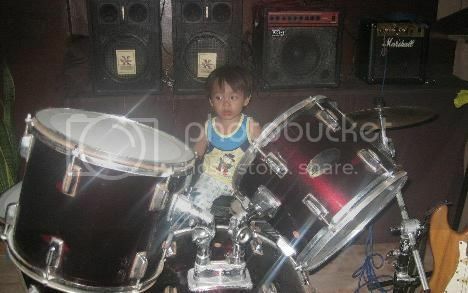 The photo below is my nephew Vince playing drums instrument. He is 2 and 10 months in the photo and his early age I saw his interest in music. Because he likes to sing, to play guitar, to play drums. The photo below is in the house of my neighbor, when the first time he saw the drums he wants to play it and every time he asked me mama I want to play drums. Good thing because the neighbor is kind and she invited Vince to try to play drums. Although he doesn’t know how to play the right position I also saw his interest and love the music. Anyhow, I just tell to my sister the mother of Vince to share 50percent to be able to buy a kind of pearl drums for sale. I also told that her son is very much interested to the music. I know that Vince will be a good musician in the future because he is showing interest in music. During Christmas season they have a lot of activities like, Christmas party, family reunion, exchange gift or monito monita, and a lot more. I remember last Christmas my niece gave me a curve blackberry cell phone, once again thank you niece for giving me a kind of Christmas gift and so far I also used it. The first time I used it I actually learn how to use the curve blackberry phone because it is a censored and for me it is hard to use it. For me it has many benefits like gsm phones unlocked because it contain a good features good applications, themes and a lot more. As of now I can keep it because it is a special gift that I received last Christmas. Jessica is the name of my friend since high school. She encouraged me to put up our own business the business she offer me is a personalized ring, like college ring, weeding ring, friendship ring, lovers ring and many more. The kind and design of ring is look like a: senior class rings. I was very happy because after 6 six years we meet again each other and according to her she manage her own personalized ring business located in Manila. I like her offer but I also tried to study the place and sales in the market here in our hometown. She brought me some examples of personalized ring and we decided to visit and offer the school of college here in our hometown. This is the first step we make, and no harms for trying for business. Just because I feel bored I went to SM mall to make myself happy and for fun. I went to department store area to look some blouses and shorts for me. Actually I do not buy but I have some choices if ever that I buy the items. After window shopping I went to KFC fast-food because I feel hungry and then I just ordered the vegetable salad and pineapple juice only, I just eaten while waiting my hubby. After a few minutes my hubby will come and he encourages me to buy a kind of floor drain covers for our comfort room in Ace hardware because the cover of our floor drain is break and need to replace it. Actually, our comfort room needs a make over but we don’t have enough money to do it. So my hubby tried to a simple make over of our comfort room.